After a brilliant origin story in the previous volume, Britannia: We Who Are About to Die, lets loose its protagonist, Antonius Axia, the world's first detective in a new harrowing mystery. The former soldier turned "detectioner" after a brush with death, Antonius must aid the Vestals who imbued him with the understanding of human psychology, in investigating a grisly murder. As Nero descends into madness, he threatens the Vestals to turn Rome's misfortunes around by appeasing the gods or else. The stakes couldn't be higher for everyone as a seemingly routine crime scene takes on a supernatural turn. The disembowelment of Rome's high-born has everyone shaken. Antonius must wade through the toxic masculinity of Rome's hierarchy and Nero's paranoia to gather clues and find leads. Peter Milligan unfolds a dense and intricate plot that seamlessly combines history with fiction. This is a legitimate murder mystery that touches on a few contemporary themes. The subjugation of women runs rampant unless you're a mystical conduit of the gods and even then, the Vestals' future are also in jeopardy. The subtext of the misogyny leads directly to the introduction of a new character. She looks to be a powerful game changer going forward. A symbol of hope, born from tragedy, to become a force of rebellion. Juan Jose Ryp is at his best here with some of the best visual storytelling you'll see in comics. He concisely navigates the moments of exposition and dialogue by hitting the right beats. Small panel, small panel, small panel, then a big reveal in a bigger panel. There's instant gratification for the reader to hang on through a plot dump for example because something else is exposed that propels the story forward. Ryp provides immense detail that brings ancient Rome to life. From architecture to finishes, Ryp has done his homework and gives 'Britannia' the authenticity it deserves. Colorist Frankie D’Armata uses warm earth tones to ground this period piece where it belongs while adding splashes of brighter colors in strategic places - blood, guts, forest, hair, etc. 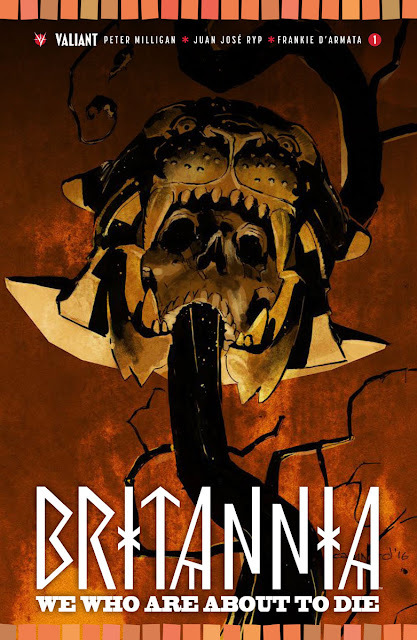 Britannia: We Who Are about To Die is another fantastic mini from Valiant that historical fiction and supernatural mystery fans will love. Milligan, Ryp, and D'Armata have created an immersive and bloody whodunit that is well-paced, intriguing, and beautifully illustrated. This is a good hearty read that will leave you wanting more. Isn't that what we're all looking for in a comic?